I have lost a lot of momentum in my book reading this year. I started with the very ambitious Goodreads goal of finishing 50 books this year and for a majority of the year, I was ahead of schedule. It’s now November and I have two months to read 10 books. It might not happen. It didn’t help that I started numerous books and didn’t finish them because they bored me, or that I am using precious reading time to prep my Pathfinder game. Enough with the whining, here’s what I read in October. It was a good month, I read very solid books. 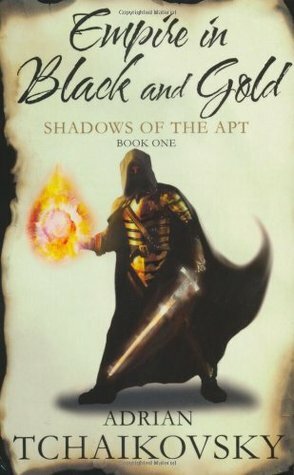 Empires of Black and Gold by Adrian Tchaikovsky is the first book of a 10-book series called Shadows of the Apt. I added it to my reading list when I was on a steampunk kick. It’s classic fantasy meets steampunk, with some rather interesting concepts. The fantasy world the series is set in sounds rather generic, but the people living in it are anything but. There are different races called Kinden, who have all descended from an Ancestor Spirit and share traits with insects. They are Ants who can communicate via telepathy, spiders who can crawl walls and plot nefariously, scorpions who have claws, flies who can fly, etc. People with insect traits. Fascinating. The Kinden are split again. There are some who are apt, like beetles, who can use and create technology like flying machines, trains, and cars. Those who are not apt cannot. Some, like the moths, cling to old and forgotten magic. Yet now they all have to come together, because they are threatened by a race of kinden that comes and offers trade and prosperity: the Empire of the wasps. Master Stenwold, a Beetle-kinden teacher in the university city Collegium, has witnessed how brutally the wasp-kinden advance their empire and is organizing a spy-ring for what he thinks is impending invasion of the Lowlands. He is sending his most promising students to the industrial city of Helleron, to get in touch with his contacts there, to find out more about the plans of the wasps. But the wasps interfere with the plan, splitting the group up, and no one knows the wasps’ masterplan just yet. – Yeah, so Stenwold is the Gandalf of this series, and his niece Cheerwell is a bit like Frodo. You have the classic party on a grand quest. I loved the book for the worldbuilding and the concept of insect-kinden + technology, that was very well done. The writing is probably the weakest part of the book, but I am definitely planning on reading the sequel. 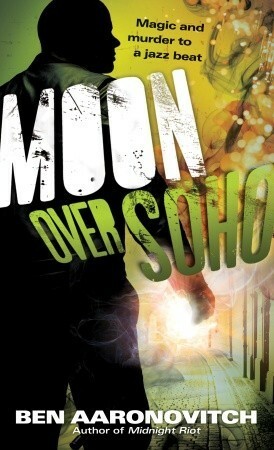 Moon over Soho by Ben Aaronovitch is the sequel to Rivers of London or Midnight Riot, depending on which side of the Atlantic you are on. Peter Grant, the street copper turned wizard’s apprentice copper, is dealing with the aftermath of his first adventure, when a new series of deaths is brought to his attention. Apparently jazz musicians keep dying, and he senses a touch of magic on the corpses. But why would jazz musicians die after performing? In order to solve this case, Peter involves his dad, the former junkie who plays jazz music, and gets involved with the girlfriend of one of the dead guys. The book introduces a recurring villain who has it in for Peter and his boss Detective Nightingale. – I loved the first book, but felt it lost momentum and tension in the later parts. Not so with this book. I love the super-dry British humor. I can connect a lot better with the British Peter Grant than the so-American Harry Dresden. It was funny, witty and exciting, sometimes creepy to read. Even if it dealt with jazz vampires, which sounds ridiculously silly. Or female assassins who chop off dicks with their vaginas. I want more. 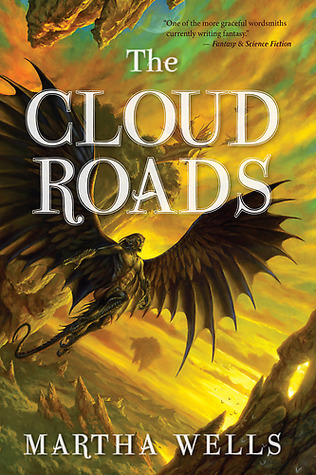 Taking the prize as surprise of the month, we have The Cloud Roads by Martha Wells, the first book of the Books of the Raksura series. How many fantasy books do you get where all the races are unique and different? The kinden concept from the Shadows of the Apt series was cool, but the Raksura and all other races in this book, especially the fell, feel very alien. The world is called Three Worlds, actually, because it has realms on the ground, in the air and in the sea. Our protagonist is Moon who has moved from groundling tribe to groundling tribe in hopes of fitting in. But he is not a groundling. He can shift to be a creature with wings and claws similar to the most hated race of the world, the Fell, which inevitably gets him kicked out of settlements once people find out he is a shifter. He is alone, because his mother and siblings died, leaving him alone in the world. When he gets kicked out again from his latest home, he is rescued from certain death by a member of his own race that he didn’t even know existed. Stone brings him back to his tribe of the Raksura, where it turns out that not only Moon is a Raksura, but one of the rare consorts who can breed with a queen. But as Moon tries to figure out if he can fit in with his own people, an attack of the vilest sort is imminent from the Fell. We have great world-building, with mysterious islands in the sky full of ruins, flying ships, and a race full of kickass-women like Jade, Flower and Pearl. Moon can be a bit whiny, but it didn’t stop me from pretty much devouring this book. Greatly enjoyed, will definitely read on. November should be awesome too, as I am currently reading another great book. Cross your fingers I will make my goal! Good to know I am not the only one with the issue, but frustrating anyhow. I was doing so well all year! I blame Pathfinder rulebooks distracting me. 🙂 I’ll keep going as well!